Lindani Dhlamini believes in getting up and doing things for herself. She owes much of her success as a business woman to this attitude and to financial help from government's Umsobomvu Youth Fund. Her company, Xabiso Chartered Accountants, is one of a few black, female-owned companies in the accounting industry. 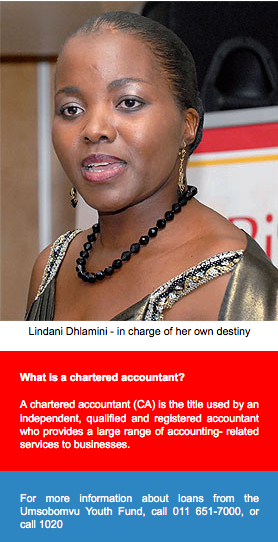 When Lindani Dhlamini started her company in 2004, it made a profit of R43 000. In November last year, its profit increased to R18 million. Thanks to laws like the Preferential Procurement Act, Dhlamini's company has been able to tender and secure business from a wide range of companies including state departments. So far, she counts among her clients Anglo Platinum, Eskom, Public Investment Corporation and Transnet. But empowering laws in themselves do not create successful business people. 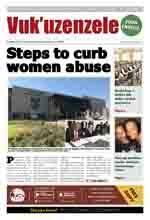 As the title of our magazine, Vuk'uzenzele, suggests, people must get up and do things for themselves. Dhlamini did just this. She talked to the Umsobomvu Youth Fund about her business plan and obtained a loan of R1,7 million to start her own business. "I am very independent and wanted to be in charge of my own destiny. One way of doing so was to start my own business," she said. Born 35 years ago in Umlazi, KwaZulu-Natal, Dhlamini completed her schooling in KwaZulu-Natal and furthered her studies at the University of Cape Town. She said she had always been interested in figures, but did not register for an accounting degree. Instead, she completed a BSc degree in Computer Science. While working as a computer programmer, her divisional manager, who was a chartered accountant, encouraged her to follow her love for figures. Dhlamini then registered for a BComm degree and later realised her dream of being a chartered accountant. Chartered accounting is a much-needed profession in South Africa. The country is short of about 22 000 chartered accountants, according to the South African Institute of Chartered Accountants (Saica). Dhlamini said people should make use of government's programmes and study loans to help them achieve their goals. She believes that through its policies, government makes it possible for people to be independent and start their own companies. Apart from her own success, Dhlamini encourages others to achieve success by helping them to develop skills. She mentors her employees in accounting skills and is sponsoring seven learners through high school and two students through university. Dhlamini also offers financial support to employees who want to further their studies. In doing this, she is helping government's Joint Initiative on Priority Skills Acquisition (Jipsa).